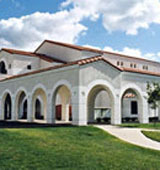 Thomas Aquinas College received a A.
Washington Monthly's ranking of 76 out of 224 of Affordable Elite Colleges - Overall Rank was a major contributor to this grade. "This California liberal arts school provides a unique education. No classes exceed 20 students and there are no majors, textbooks, or lectures. Instead, Thomas Aquinas students read directly from the original works of Aristotle, Einstein, and, of course, Thomas Aquinas, and the rest of Western Civilization's greatest philosophers. "Tutors" lead classes by asking thought-provoking questions." What are the top 3 reasons someone should attend Thomas Aquinas College? What is a typical Thomas Aquinas College student like? Describe the type of person that should attend Thomas Aquinas College. Because of the school's unique curriculum, candidates must demonstrate a penchant for scholarship. In lieu of textbooks and lectures, this college's students would study only original works -- the great books of Western civilization -- and examine, sometimes refute, and invariably learn from their claims in small classes that employ Socratic discussions. Moreover, the academic program would be ordered to the study of God in precisely the manner in which the Church has for centuries prescribed, according to the mind of Her Universal Doctor, St. Thomas Aquinas. Four decades later, on a beautiful campus neighboring California's Los Padres National Forest, stands the Thomas Aquinas College of today -- a witness to its founders' faith and diligence. The College's ranks have swelled to the maximum capacity of 350 students, and a roster of distinguished faculty has expanded accordingly. While holding true to its founding vision, the College has earned a national reputation for academic and spiritual vigor, becoming a model for the many new, faithful Catholic schools that have followed. Through God's grace, it has also graduated generations of alumni who have gone on to faithfully serve the Church and society in myriad ways. It is my delight to share the good news of Thomas Aquinas College and its promise for the future of Catholic liberal education. I invite you to investigate our unique academic program, our community of faith, and the joys of campus life. I encourage you to learn about our admissions process and our alumni,and to explore the many ways friends can support the College. And if you are in Southern California, or you can make the trip, I invite you to visit the campus, to experience our classes, and to see for yourself how we go about this noble mission of forming leaders in service of the truth. What are the top 3 things that students do for fun at Thomas Aquinas College? We have dances nearly every month, square dances, swing dance, and even some boogy. Occasionally the dorms hold Fight Nights, which are like amateur boxing fights with even visitors joining in. The average student pays $19,169 for tuition, fees, and other expenses, after grants and scholarships. Learn more about financial aid at http://thomasaquinas.edu/admission/financial-aid. Estimate the net price for you at http://thomasaquinas.edu/admission/net-price-calculator-financial-aid-calculator. Want more info about Thomas Aquinas College? Get free advice from education experts and Noodle community members.